Augsburg welcomes Eintracht Frankfurt in a match from the 12th round of the German Bundesliga. These are our thoughts about this clash at the WWK Arena. Augsburg are currently 10th in the Bundesliga standings with 13 points and a record of 3 wins, 4 draws and 4 defeats. In their last five games Augsburg won just once – against Hannover 96, making two draws and suffering two defeats. In their last game Augsburg suffered a 1-2 defeat against Hoffenheim away from home. Alfredh Finnbogason scored for Manuel Baum’s team, but Hoffe managed to win with goals from Andrej Kramaric and Reiss Nelson. Before this Augsburg were in a run of three consecutive wins without loss, losing for a last time against Borussia Dortmund. Eintracht Frankfurt are the current holder of the DFB Pokal. They are also doing pretty well in the Bundesliga as well. Right now Eintracht are 4th in the standings with 20 points, being just 2 points behind the 3rd RB Leipzig. At this moment they have a record of 6 wins, 2 draws and 3 losses. In their last five matches Eintracht are doing very well, winning four times and doing one draw. The only time they lost points was while the 1-1 draw with Nurnberg away from home. Meanwhile they achieved wins over Hoffenheim, Fortuna Dusseldorf, Stuttgart and Schalke 04. If they continue like this, Eintracht could be a real contender for a Top 4 finish and a qualification for the Champions League. 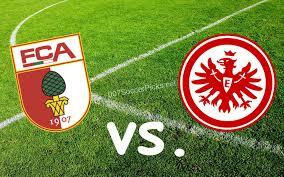 These are our thoughts about the Bundesliga clash between Augsburg and Eintracht Frankfurt on Saturday afternoon. Augsburg will try to bounce back after the loss against Hoffenheim, while Eintracht will try to continue with their great run, securing their position in the Top 4 for at least one more week. Let’s see.